It is a play within a play. Like Hockney’s classic painting of 1963 that now introduces his exhibition at the Tate, it involves multiple levels of reality where, in this case, the camera lens is the boundary between picture and object domains. The object – in this case the film location – along with its making, is remote from the real world and challenges the relation between representation and reality – or between “art and life,” as Hockney dryly put it. It is all perceived in the imagination: how we see the world and how that world of time and space can be captured. For the picture maker and picture viewer it is perceived differently from the spectator at the location because the picture domain is different. Bloomsbury Square is not ‘heart of Bloomsbury’, which conjures up images of peaceful, green, leafy squares untainted by the passage of time. Not so. It is the edge of Bloomsbury at a point where it collides abruptly and noisily with Holborn, the fringes of Covent Garden, the sharp end of mass tourism and the highest levels of air pollution in the country. So in the mind it is perceived as something else, something moulded by its streetscape, its buildings and its heritage. One of the objectives of the Bloomsbury Association is to safeguard that perception, if not the actuality, for the benefit of its residential and business communities and for the delight of those who are attracted to come and record all that in film. Illusion and artifice is a strong feature of the filmmakers’ visual art but it is becoming increasingly more difficult. Location managers comment they now struggle to find really dirty brickwork in Bloomsbury as an authentic backdrop to period pieces. So Wonder Woman came to Bloomsbury on a chilly, damp day in January. It is difficult to imagine the amount of time, money, and energy that went into dressing all the extras for the time-period, keeping all modern vehicles/objects out of the streets, and making the buildings of Bloomsbury Square and Sicilian Avenue look like they did in the early 1900s – scruffy and dirty and amply paved with horse droppings – all for a few minutes of shooting. To watch it all slowly unfold is, of course, interesting because it wraps streets in a new guise. Like watching paint dry, it can be therapeutic but the novelty soon wears off, particularly if it happens almost every weekend. The challenge for film location units is integrating with the local community, or not, depending on how hard the filmmakers try. Unbeknown to those transient visitors, for those who live here this part of Bloomsbury is now recognised as a ‘community under stress’ because of the commercial pressures that are put upon it and filming is one of those pressures. Its southern and western fringes are designated as growth areas, catalysed by the impending arrival of Crossrail, massive growth in tourism and tight constrains on further intensification of the 24/7 economy, across the border in Soho and Covent Garden. It is a very different Bloomsbury to that serving as an erudite literary backdrop to Helene Hanff’s 84 Charing Cross Road in the early 1970s when its buildings were authentically muckier. So, when the weekend comes, it is good to have a lie-in and not be woken abruptly by the fleet of air- conditioned, articulated trucks and generators that can arrive with the location team at 5:30 in the morning. Sometimes upwards of 40 vehicles and hundreds of extras can pop-up to create instant city on otherwise deserted streets. Careful preparation, prior consultation and thorough consideration are essential to mitigate against that ‘community under stress’ effect. It is the worst possible thing to get off to a bad start by firing up a noisy, smelly generator under someone’s bedroom window at dawn and leaving all their mess behind at the end of the day. So a ‘Considerate Constructors Scheme’ for location units is essential and this is where FilmFixer steps in. What happens can’t be anticipated every time but they can have a good go at it – and they have to because it is something that happens in Bloomsbury regularly. Not only is the area rich in vista interest but, sadly, there is also interest in exploiting the revenue generating potential of public space. So what is the attraction of Bloomsbury? The area gives its name to the Bloomsbury Group of artists, the most famous of whom were Virginia Woolf and Vanessa Bell – who some consider the original wonder women – who met in private homes in the area in the early 1900s. The Pre-Raphaelite Brotherhood of artists, founded in John Millais’s parents’ house on Gower Street in 1848, opposite where the Bloomsbury Association is now based, preceded them. The earliest record of the area that would become Bloomsbury is in the 1086 Domesday Book, which records that the area had vineyards and “wood for 100 pigs”. The first mention of Bloomsbury was in the year 1201, when William de Blemond, a Norman landowner, acquired the land. The name ‘Bloomsbury’ is a development from ‘Blemondisberi’ – the bury, or manor, of Blemond. In the early 1660s, the Earl of Southampton constructed what eventually became Bloomsbury Square. Expansion came in the later 17th and 18th centuries when the Russell family developed the surrounding area into what was then a fashionable residential suburb. The major development of the squares that we see today started in about 1800 when Francis Russell, 5th Duke of Bedford removed Bedford House and developed the land to the north with Russell Square as its centrepiece. So is there a deeper significance in the Bloomsbury connection to DC Comics’ Wonder Woman that justified the Bloomsbury Square location, apart from the obvious Bloomsbury Group activity and links to women’s emancipation? Some prefer the other Bell – Gertrude – in the war-ravaged landscapes of the Middle East after the First World War than Gal Godat decades later. Gertrude Bell was arguably the most powerful woman in the British Empire in her day. An earlier wonder woman, she shaped the modern Middle East after the First World War in ways that still reverberate today. More influential than her friend and colleague Lawrence of Arabia, Bell helped draw the current borders of the Middle East. The feature length documentary film of her life, Letters from Baghdad, by Between the Rivers Productions, took five years to produce. Its location was film archive and takes us into a past that is eerily current and explores an extraordinary individual through the intersection of history, culture and film, just as Wonder Woman does in a comic-book cinematic universe today. Coincidentally, it opened a few weeks ago at Curzon Bloomsbury. Ironically, there is another link to Bloomsbury. Carolyn Cocca’s book Superwomen investigates how and why female superhero characters have become more numerous but are still not-at-all close to parity with their male counterparts. It considers how and why they have become a flashpoint for struggles over gender, sexuality, race, and disability; what has changed over time and why; how these characters have been portrayed and reacted to, and how and why representations of superheroes matter, particularly to historically underrepresented and stereotyped groups. It has just been shortlisted for the 2017 Eisner Awards in the Best Academic/Scholarly Work category and, yes, it is published by Bloomsbury. The Bloomsbury Association is a voluntary association that was founded in 1972. It was established for the express purpose of furthering the social, economic and environmental well-being of individuals living, working and studying in Bloomsbury. The Association continues to serve as a voice for the community and independent businesses on matters that include civic and social responsibility, quality of life, licensing, planning and the environment. The Association seeks to promote high standards of planning and architecture in the area, to strengthen the area’s fragile social cohesion and to secure the preservation and enhancement of Bloomsbury’s rich cultural and architectural heritage. It may also take an interest in proposals of wider impact located outside this area. The Association has no income and its members devote their time free of charge. Voluntary contributions from local residents and businesses are welcome and are the only way that we can do what we do. We support Camden’s policy of encouraging artists and filmmakers to use the public realm in the borough as this helps our economy to thrive and adds to the vibrancy of living and working in Bloomsbury. We enjoy a good working relationship with FilmFixer who manage Camden’s Film Office and are happy to share our knowledge of the area, it’s inhabitants and businesses with them, so that we can ensure this industry provides a real economic benefit to the local community and the borough and is managed in a way that is respectful to all the inhabitants. We are recipients of occasional modest donations for participating in this partnership. These voluntary donations are welcome and help us to continue our work to deal with ‘community under stress’ issues and improve the quality of life of everyone who lives and works in our area. Recent examples of how film donations are put towards the community expenditure include appointing legal representation to contest a controversial licensing application for a well-known nightclub and seeking professional expertise to advise on the air quality, transportation and engineering aspects of a proposal to create London’s, if not the country’s, first entirely underground hotel. This was challenged over a period of five years, initially at planning application stage and then at a subsequent planning appeal and involved substantial fee expenditure. 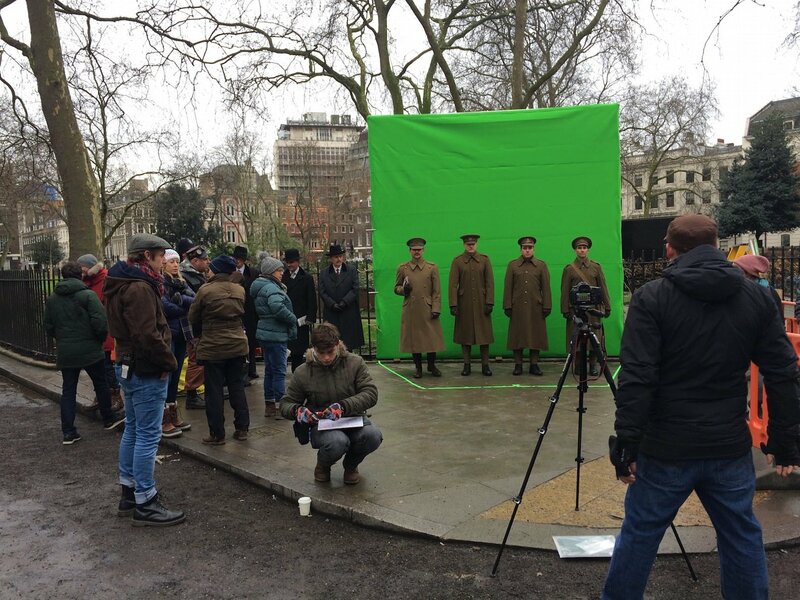 As mentioned earlier, in doing such things, the Association is continually striving to safeguard the unique characteristics of the area that make it attractive for filming in the first place.